A completed project, ready to amaze you and your friends! 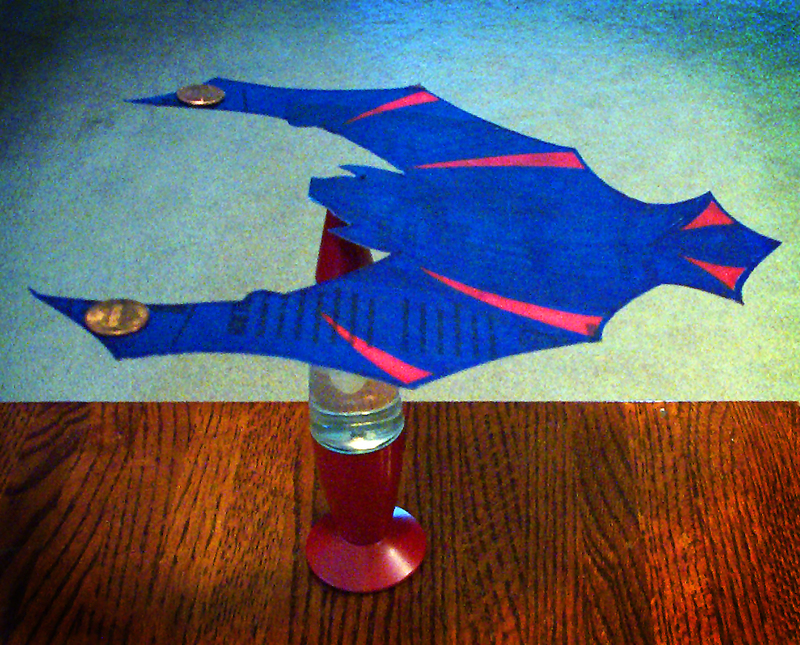 Two cents and a handful of common household supplies — plus our nifty template — and you, too, can make this awesome bat- or more traditional bird-shaped center-of-gravity wing! Noting that this is not at all a spooky campfire story, it’s nonetheless a cool project that we think will appeal to the same audience as our readership. Plus, making a bat wing is kinda spooky! This project can be used to partially complete Webelos Scientist requirement 11; indeed, it was inspired by the experiment on page 423 of the current Webelos book. Click here to download the printable bird- and bat-shaped Center of Gravity Wing Templates. • What effect does using a lighter coin have? What effect does using a heavier coin cause? • How does the location of the coin affect the center of gravity? ~ by Random Handyman on May 25, 2012. Wow — whaddya say in response to that? Very proud and glad to please you, amongst a few discerning, intelligent folks out in Internet-land : ). Hope you keep reading, because we’ll keep writing! Thank you so much for the templates.Teaching a class for Cub Scouts (5th grade Webelos)to earn their Scientist Activity Badge. Will pass along to other leaders this link! Great! Your group of boys is exactly who we created this for (but others — grown ups and siblings as well — can do this project and have fun with it, too)! You might want to also visit the Scouter’s Corner category (see links to the right) for Pinewood Derby design templates and a project for carving neckerchief slides. We have found — contrary to our presupposition — that using a lighter weight cardstock allows the wings to sag down and forward, creating a more three-dimensional appearance, enhanced reality of flight (of flapping wings) and better balance!